George Edward "Stump" Wiedman (February 17, 1861 – March 2, 1905) was an American professional baseball player from 1880 to 1893. He played nine years in Major League Baseball, principally as a right-handed pitcher and outfielder, for five different major league clubs. He appeared in 379 major league games, 279 as a pitcher and 122 as an outfielder, and his longest stretches were with the Detroit Wolverines (288 games, 1881–85, 1887) and the Kansas City Cowboys (51 games, 1886). As a pitcher, he compiled a 101-156 (.393) win–loss record with a 3.61 earned run average (ERA) in 2318 1⁄3 innings pitched. He led the National League in 1881 with a 1.80 ERA and totaled 45 wins in the 1882 and 1883 seasons. He pitched more innings for the Wolverines (1,654) than any other pitcher in the club's history. Wiedman was born in Rochester, New York, in 1861. He attended Rochester University and was a pitcher on the baseball team there in 1880. He also played for the Hop Hitters Club of Rochester, with Buck Ewing as his catcher. Wiedman made his major league debut with the Buffalo Bisons on August 26, 1880. In the final weeks of the 1880 season, Wiedman started 13 games for the Bisons and appeared in another four games as a relief pitcher. He compiled a 0–9 record and 3.40 earned run average (ERA) in 113 2⁄3 innings pitched. Wiedman began the 1881 season with the Washington Nationals, then joined the Albany, New York, club in July 1881. After the Albany team folded, Wiedman joined the Detroit Wolverines and brought his catcher Sam Trott with him. Wiedman and Trott made their debut for Detroit on September 3, 1881, a 4-3 loss against Buffalo. 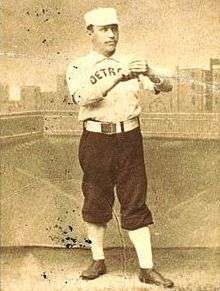 Wiedman started 13 games for Detroit in the last month of the season, compiling an 8-5 record and 1.18 ERA in 115 innings pitched. He led the National League in ERA and had the lowest WHIP rating (walks + hits per inning pitched) at 1.043. Wiedman had another strong year in 1882, winning 25 games, pitching 411 innings and 43 complete games with a WHIP rating of 1.046 (4th best in the National League). On August 17, 1882, he was the losing pitcher in one of the great pitching duels in baseball history. Monte Ward was the pitcher for the Providence Grays, and he and Wiedman held the game scoreless through 17 innings. Wiedman allowed only seven hits but lost the game in the 18th inning on a home run by Old Hoss Radbourn, who was playing in right field. While he won 25 games in 1882, Wiedman also ranked among the league leaders with 20 losses. Wiedman lost at least 20 games for five consecutive seasons from 1882 to 1886, ranking among the league leaders in losses for each of those seasons. Wiedman also appeared 88 games as an outfielder for the Wolverines during the 1883 and 1884 seasons. He scored 58 runs, had 50 RBIs, and compiled a .175 batting average during those seasons. Applying the sabermetric Wins Above Replacement (WAR) model, Wiedman earned negative ratings of -1.6 and -1.7 in 1883 and 1884. In 1887, Wiedman returned to the Wolverines, where he went 13–7, helping them to the 1887 National League pennant. Over the course of six seasons, Wiedman pitched more innings for the Wolverines (1,654) than any other pitcher in the club's history. After the 1885 season, Wiedman was released by the Wolverines to league control and then obtained by the newly formed Kansas City Cowboys. He appeared in 51 games as a starting pitcher for the Cowboys, including 48 complete games, and also appeared in three games as an outfielder. He compiled a win-loss record of 12-36 (.250) and a -1.4 WAR rating with a 4.52 ERA in 427-2/3 inning pitched. He led the National League in both losses (36) and earned runs allowed (549). His 36 losses in 1886 is tied for ninth highest in major league history. The Kansas City club compiled a 30-91 record and disbanded after the 1886 season. In early August 1887, Wiedman was sold by Detroit to the New York Metropolitans for a price estimated at between $800 and $1,000. Wiedman started 12 games for the Metropolitans in the last half of the 1887 season and compiled a 4-8 record with a 4.64 ERA. At the end of the 1887 season, the Metropolitans sold Wiedman to the New York Giants. Wiedman appeared in one game for the Giants in 1887 and two games in 1888. He compiled a 1-2 record and 2.77 ERA in his three games with the Giants. He played in his last major league game with the Giants on July 5, 1888, at age 27. Although his major league career ended in 1888, Wiedman continued to pitch in the minor leagues. He compiled a 10-4 record for the Toronto Canucks in 1884. He remained in Canada in 1885, playing for the Hamilton Hams of the International League. He concluded his professional baseball career in 1893 with the Providence Clamdiggers of the Eastern League. After retiring from baseball, Wiedman worked as an umpire for a time, including one season as an umpire in the National League. He then became a saloon operator in Rochester, New York. His first venture in the saloon business was the firm of Coughlin & Weidman. He later formed a partnership with his brother-in-law, Michael "Silk" O'Loughlin, a well-known umpire. Wiedman and O'Loughlin operated a saloon for several years at 158 State Street in Rochester. That establishment was sold in approximately 1903, after which Wiedman and O'Loughlin conducted business at another location. By early 1905, Wiedman developed a tumor which was believed to be throat cancer. He traveled to New York City where he met with medical specialists and underwent an operation that resulted in his death. He died in a New York hospital in March 1905 at age 44. He was buried at Holy Sepulchre Cemetery in Rochester, New York. In an obituary, the Sporting Life wrote: "Weidman was a clean-cut, honest and well behaved ball player, and a credit to his profession at all times. Peace to his ashes." 1 2 3 4 5 6 7 8 9 10 11 12 13 "Stump Wiedman Statistics and History". baseball-reference.com. Retrieved July 17, 2014. 1 2 3 4 5 6 7 Francis C. Richter (March 18, 1905). "Another Veteran Gone: George E. Weidman, Who Pitched in One of the Record Games of Base Ball History, Passes Away" (PDF). Sporting Life. 1 2 "Sporting Matters: The Bisons Get the Best of the Wolverines on Saturday By Which Defeat the Detriots Take a Position Below the Bostons". Detroit Free Press. September 4, 1881. p. 4. ↑ "Detroit Wolverines Player Career Pitching Register". baseball-reference.com. Retrieved July 17, 2014. ↑ "Single-Season Leaders & Records for Losses". baseball-reference.ccm. Retrieved July 17, 2014. ↑ "Kansas City Cowboys Team History & Encyclopedia". baseball-reference.ccm. Retrieved July 17, 2014. 1 2 "Stump Wiedman Minor League Statistics". baseball-reference.com. Retrieved July 17, 2014. 1 2 "Famous Pitcher Dead: George Weidman Worked In Memorable 18-Inning, 1-to-0 Game" (PDF). Sporting Life. March 18, 1905. p. 9.